It's almost time for the summer Olympics and we are so excited. The last summer Olympics were in 2012 and they were here in London, we took Ethan but he was only 9 months old so he doesn't really remember it! This time around we'll just have to watch from home, but we're doing lots of little activities to learn about the games. It's a great opportunity to learn about different countries and sports! So we're starting with a sensory bin inspired by the Olympic rings and the talented athletes. I used buckwheat as a base for our sensory bin, because I'll be honest with you, my family does not like buckwheat! I bought roasted buckwheat and buckwheat flakes and tried it in all sorts of different recipes with no success, so of course we couldn't let it go to waste and have used it in our sensory bin. This bin would work just as well with rice, pasta, chickpeas, oats or any other sensory material that can be coloured. We used the same technique to colour the buckwheat as we've used for pasta by separating the buckwheat into ziplock plastic bags and mixing it with paint, then leaving it out to dry on trays. Once the buckwheat was dry I put each colour into its corresponding coloured bowl and placed all of the bowls into a large shallow bucket arranged in the pattern of the Olympic rings. I then added a few little Happyland athlete toys that we had (but any people will do). Then I put it down for the children to explore. 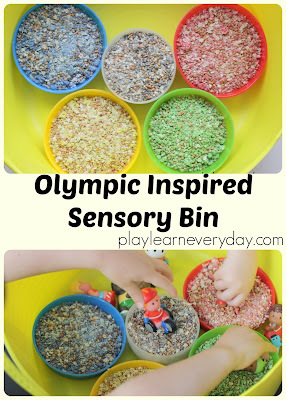 The first thing that they did was to pick up the athletes and have them run around the sensory bin a few times before putting them into one of the coloured rings. Then as they started exploring they had long jumpers jumping into the bowls of buckwheat and swimmers swimming through them. The runners and wheelchair racers were whizzing around the buckwheat and finding their way to the finish line. And then they decided it was time to dump out all of the bowls and mix the colours together! The colours look really lovely together and the kids had so much fun exploring the buckwheat and picking up handfuls to let it run through their fingers. They pretended that it was rain and the rain was falling on all of the athletes doing their sports. Ivy really enjoyed playing with the colourful buckwheat and stayed exploring it for ages. We are looking forward to the Olympics even more now and can't wait to learn more about all of the nations that are competing and all of the events that the athletes are participating in.